With plethora number of natural attractions and exhilarating landscapes, United Sates has topped the list as a most visited country by immigrants. Have you ever thought why most overseas applicants prefer to apply for USA visitor visa and why this has huge immigrants’ population of more than 11 million? One of the main reasons behind vast immigration is being a super power with dynamic and steady economy. Besides its secure and tranquil ambiance, this modern nation also proffers lucrative number of career and employment opportunities. There are many US visitor visa options for an applicant who aspired to be a part of US economy or wishes to visit the country for few months. In general a citizen of an overseas nation who desires to enter US must obtain either a nonimmigrant or immigrant visa. Visitor visas are non-immigrants for overseas applicants who wish to reside in United Sates for temporary duration for pleasure, tourism or visiting (B2 tourist visa), B1 visitor for business visas, or for both the purposes (B-1/B-2). 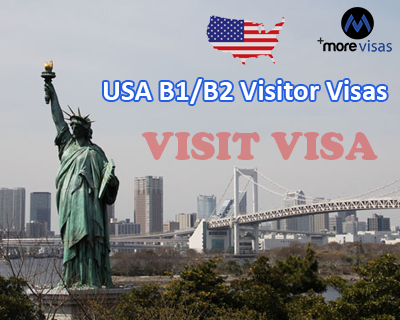 USA visitor visa is also called B1-B2 or B2 visa. Any overseas individual including their family members who aspires to visit USA for visiting family, children, relatives, friends, for medical treatment, attending special events or for sightseeing can make use of the B2 tourist visa. Remember people entering United States through tourist visa are not permitted to involve in the study, work or business purposes. In case, your purpose of the visit is a business then you need to apply for B1 Business visa. Based on the purpose of your visit he/she is recommended to choose the category that is apt to them. The maximum duration of stay in United Stated through visitor visa of the country can be six months or less. However, an extension to a maximum of six months is possible with the appropriate approval from the respective authorities. If you wanto to visit USA, fill out our Enquiry form, so one of our visa expert will approach you soon.